I ran into a fascinating juxtaposition in a fascinating (for a difference reason) article recently. 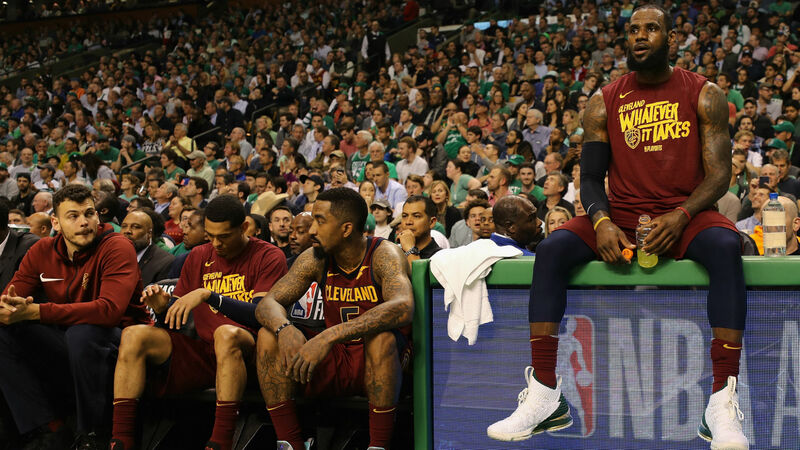 The article in question, an ESPN piece by Brian Windhorst, is about LeBron James “perfecting the art of resting while playing.” If that sounds counter-intuitive, it probably should. We’re used to thinking of athletes “giving 100%” (if not more; there’s always that mythical “110%” that people are always claiming to reach) while they’re on the court, field, pitch, or whatever. Then, they come out of the game and rest until they’re ready to go back in and give it 100% again. Of course, in sports like soccer or tennis—what I like to call the “run all the time and never stop sports”—it doesn’t quite work that way. But in basketball, the sport LeBron James plays, it does. No one would ever call James slow, but he is when he wants to be. During the regular season, James' average speed during games was 3.85 mph, according to Second Spectrum tracking data. Of all players who averaged at least 20 minutes a game, that ranked in the bottom 10 in speed. That's correct: James moved slower than just about any rotation player in the league. And since the playoffs started, James has gotten even slower. His average has slipped to 3.69 mph. Here's why: James walks a lot. During the regular season, about 74.4 percent of James' time on the court was spent walking. Again, this was in the top 10 in the league. Almost no one walked up and down the floor more than James. And in the playoffs, he's walking even more—78.7 percent of the time. Walking? Going slow when he’s able to go fast? Is this laziness? No, Windhorst says, it’s James recognizing that his team cannot compete without him on the floor. James knows that the Cavaliers are sunk without him, so he does what he can to make sure he’s always there. He’s constantly dealing with the brink of exhaustion, all so that, in a game’s biggest moments, he’s available with some energy left to do what it takes to get his team the win. Which is it? What’s going on here? Does LeBron James have enough mental toughness to decide not to be tired? Of course not. He does have the mental acuity to figure out ways to save up his energy, but he can’t just decide not to be tired. You’ve seen this in your own life, too: You don’t have the requisite mental toughness to decide lots of things. Try deciding to not be hungry when you’re starving or early when you’re late, to say nothing of deciding to be in a good mood when you’re in a bad one, or deciding to be happy when you’re sad. You can push through hunger…but it doesn’t make you not hungry. You can paste a smile on your face, but it doesn’t make you not sad. LeBron isn’t free to choose…he has to laboriously save up little pockets of energy throughout the game so that they’re available to him in crunch time. He has to stay just barely on the right side of exhaustion to avoid having nothing left when he needs it most. When LeBron’s tired, he doesn’t decide not to be. He walks. He’s less powerful than Lue thinks he is. He’s less free. In theological language, he’s bound. So are we. We’re not free to choose either. We can choose to look happy, but not to be happy. I lift up my eyes to the hills. From where does my help come? My help comes from the Lord, who made heaven and earth. He will not let your foot be moved; he who keeps you will not slumber. Behold, he who keeps Israel will neither slumber nor sleep. The Lord is your keeper; the Lord is your shade on your right hand. The sun shall not strike you by day, nor the moon by night. The Lord will keep you from all evil; he will keep your life. The Lord will keep your going out and your coming in from this time forth and forevermore (Psalm 121). LeBron, it seems, only slumbers after the game is over...and usually wins. I am exhausted all the way through, and seem to always lose. Our God, though, is on the side of losers. He’s with the exhausted. He will not let our foot be moved, and he will not slumber, or abandon us. Not ever. As an older farmer/owner of roller coaster driveway whose gravel is forever washing down to the bottom and has to be hauled back up to the top plus an older home full of surprises, I have to go slower and work more days each year to get it all done. Sometimes I choose to neglect a few things that are too hard until I have to find a way do them or one of my sons happens by and gets snared, but they get done. Shoulder injections are there for the asking. I often ask Jesus how long can I keep this up? The next day I feel lighter and know that I will go on as long as Jesus helps me.